USDA’s Natural Resources Conservation Service (NRCS) wants to remind farmers, ranchers and private landowners that many of the business issues they may need to take care of with NRCS can be done right there from their home or farm office. NRCS offers their secure online portal called Conservation Client Gateway. 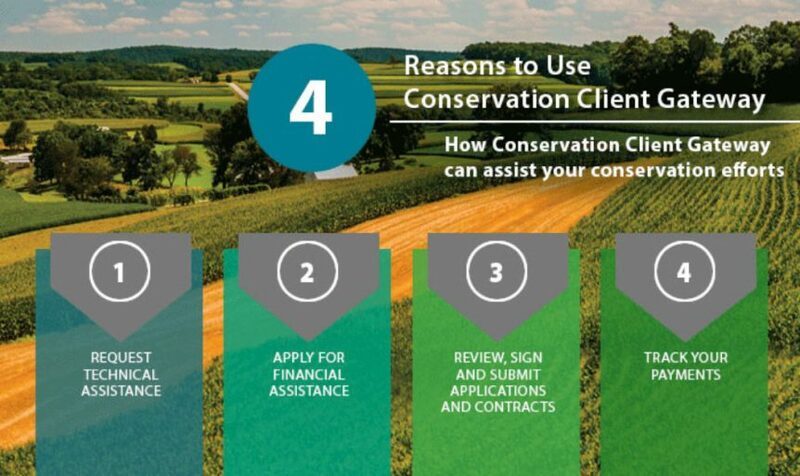 Through it you can request NRCS technical and financial assistance, review and sign conservation plans and practice schedules, request and track payments for conservation programs and more. Through Conservation Client Gateway, you can even electronically sign documents. As a matter of fact, on the NRCS website there is a video offering a demonstration on the simple process used to electronically sign documents. Plus, there is a video with farmers sharing how they benefit from using Client Gateway. Whether it is business through various NRCS programs like the Environmental Quality Incentives Program (EQIP), or even the Longleaf Pine Initiative, many tasks can be taken care of from your home or farm office, instead of taking time out to drive to your local USDA Service Center. More information can be found on the NRCS website. Or the next time you are at your local NRCS office, ask them about using Conservation Client Gateway.